A peak in the San Juan Mountain near Molas Pass on April 12, 2018. To put the Rio Grande’s situation in context, Cotten shared snowpack data taken from snow telemetry, or SNOTEL sites, around Colorado, which measure the amount, and weight, of the snowpack at specific locations around the state. 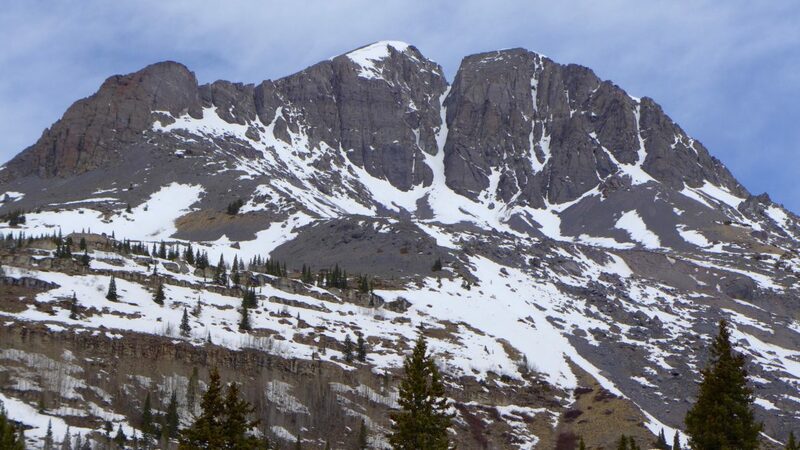 The data from the federal Natural Resources Conservation Service on April 11 showed a decline in snowpack as one travels from north to south in Colorado. The Yampa and White river basins, north of I-70, were at 89 percent. The Rio Grande and San Juan river basins are fed by snow from the San Juan Mountains. A graphic showing the snow water equivalent, or SWE, in Colorado’s snowpack from 1938 to 2018, taken from the average of 81 snow course measurement sites in the state on April 1. The graphic was prepared by Jeff Derry, executive director of the Center for Snow and Avalanche Studies in Silverton. The state is faring only slightly better, as of April 1, than in the very dry years of 1977 and 2002. Also presenting to the Rio Grande Basin Roundtable on Tuesday was Jeff Derry, the executive director of the Center for Snow and Avalanche Studies in Silverton, which studies the “dust on snow” phenomenon and how it affects the state’s snowpack. He showed the roundtable members graphs that indicate the snowpack in the southern part of the state, as of April 1, was tracking right at the same level as the very dry years of 1977 and 2002, while the whole of the state, on average, was tracking just above those drastically low years. 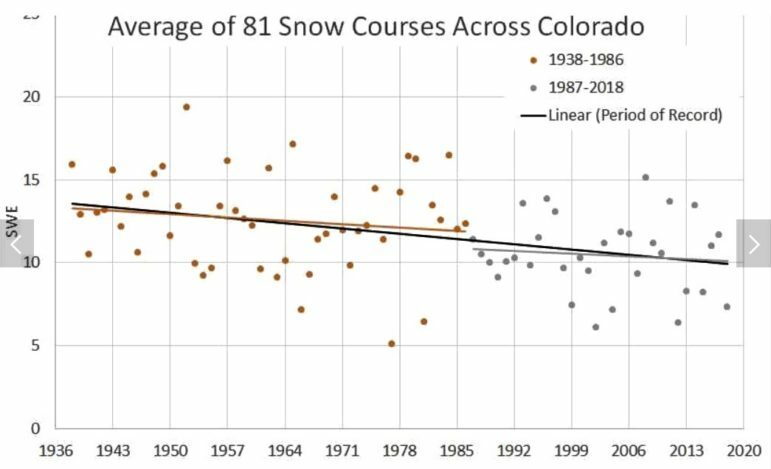 The website also shows a graph taking the average of 81 snow course sites across Colorado. 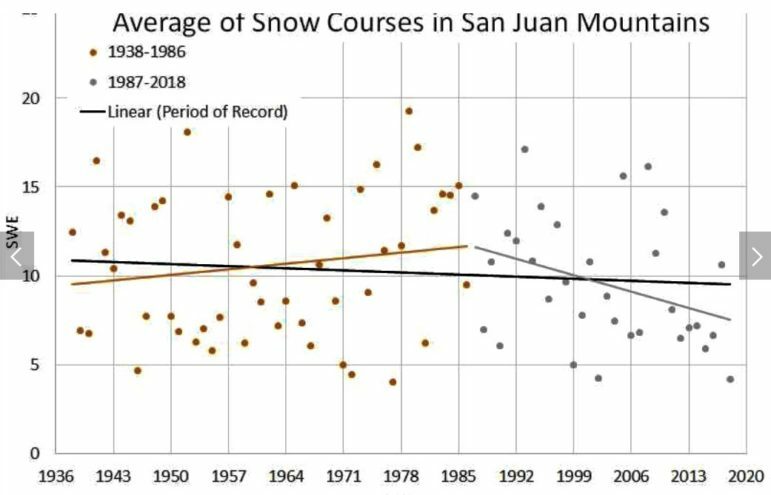 A graphic showing the snow water equivalent, or SWE, in the snowpack of the San Juan Mountains from 1938 to 2018, as of April 1. The graphic was prepared by Jeff Derry, executive director of the Center for Snow and Avalanche Studies in Silverton. As of Apirl 1, the San Juan snowpack is tracking nearly exactly with the very dry years of 1977 and 2002. 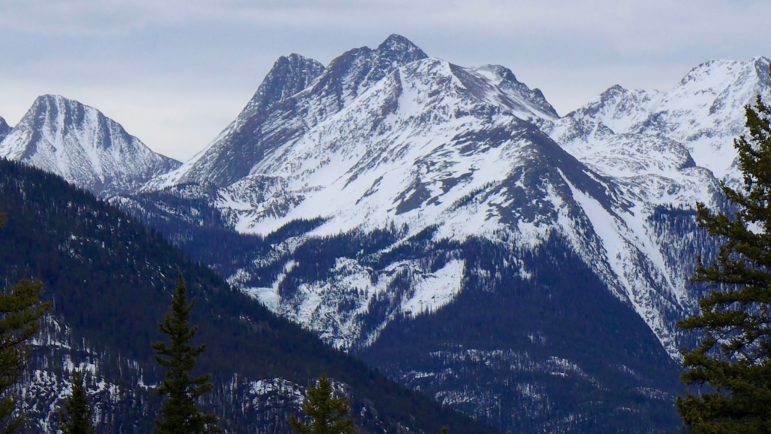 Peaks in the San Juan Mountains near Molas Pass on April 12, 2018. Derry’s graphs also included long-term trend lines dating back 30 to 80 years, which clearly indicate Colorado’s snowpack has been shrinking and temperatures have been rising, especially on the colder end of the spectrum, meaning the lowest temperatures in winter are not as low as they used to be, especially over the last 30 years. And focusing on the runoff from the San Juan Mountains, Derry showed graphics that indicate that seasonal runoff, when snow turns to water and rushes downstream, is happening about a month earlier than it used to. The peak snow water equivalent date used to be April 10, but now that benchmark is coming during the last week of March in the San Juan and Rio Grande basins. “Snow is leaving the landscape earlier,” Derry said. This year in the Rio Grande River basin looks especially stark in terms of snowpack, especially at lower elevations. For example, Le Veta Pass, between Walsenburg and Alamosa at 9,426 feet, had the lowest April 1 snow water equivalent levels since 1960, Derry said. Editor’s note: Aspen Journalism is covering rivers and water in collaboration with The Aspen Times, the Glenwood Springs Post Independent, the Vail Daily and the Summit Daily News. The Times published a version of this story on April 12, 2018, as did the Glenwood Springs Post Independent and the Summit Daily News.